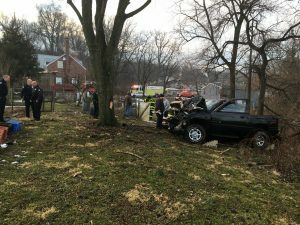 It all started at 0737 hours with a MVA with heavy entrapment in the rear yard of a house on Park Road in Ontelaunee Twp. Crews arrived, found a pickup truck heavily damaged. 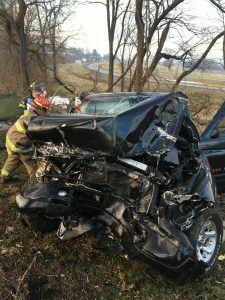 The accident was well off the main road where crews had to carry all equipment to the scene. Multiple hydraulic tools were placed in service and got the driver extricated and into the hands of EMS. Once we had equipment secured, the crew on E11 responded to Moyers Lane in Muhlenberg Twp for a gas line struck with high LEL inside the home. UGI arrived and secured the gas and crews ventilated the residence. 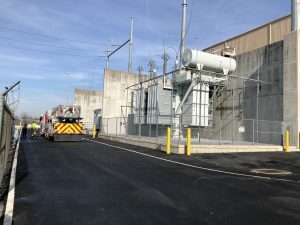 While the Rescue crew was still wrapping up the accident scene, they responded to the Ontelaunee Power Plant for a fire. Multiple units worked on the scene for about 3 hours. 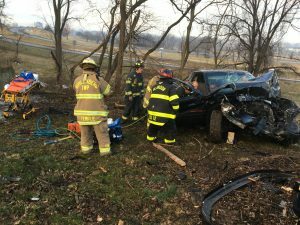 After E11 cleared Moyers Lane and the Rescue was still committed at the structure fire, E11 responded to a MVA with injuries involving a pedestrian. Upon arrival, we were recalled by EMS.